I ❤ our local SPCA!! Especially because I got my cat there; however, when I arrived I saw so many animals that needed homes. I love cats and dogs but I am very aware of my lifestyle and the amount of attention, and energy I can give an animal and how many of them. Anyhow, I asked what other donations they took besides monetary. You can find their link here. I was also told that they have volunteers that will crochet, knit and sew blankets for the animals so they have something warm and cuddly to sleep on. I know my cat LOVES minky fabric and fleece AAAAAND I had some scrap fabric from some slippers that I made my sister-in-law (yes, her favorite childhood cartoon character is Snoopy). So, I decided to put these leftovers to good use. 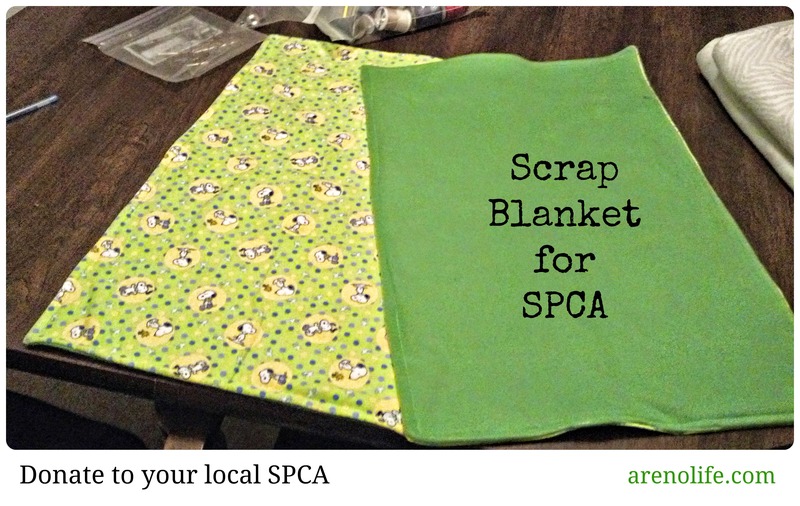 The SPCA said that the blankets need to be about the size of sheet of paper (8.5″ x 11″) and up, depending on which animal they will use them for. The blankets above are about 14″ x 24″ with fleece on one side and flannel on the other. Align your fabric at the opening to be tucked in…..
Scraps are put to good use! And a homeless animal will ❤ you for the gift!